33.1 MPG on a Sprinter Van!!! But there is more to the story! – Dave the #NVguy now at Garlyn Shelton Nissan in Temple Texas, is your Nissan Fleet and Commercial Sales Specialist. This posting was from late 2012, but receives more hits online than any other article ever written by Dave, the “Sprinter Guy” which tells me that everyone is looking for a full size van with great fuel mileage. The amazing thing about this story is it was about a van with the V6 turbo diesel, before we even had the 4 cyl twin turbo with the 7-speed automatic transmission that most all of my customers tell me are getting 20% better fuel mileage than what the V6 gets. So now we have two great engine offerings for the full size Sprinter vans, the 3.0 liter V6 turbo diesel with the 5-speed automatic or the more fuel efficient 2.1 liter inline 4 cyl twin turbo charged engine mated to the 7 speed automatic. PLEASE – THIS IS MEANT FOR THE HUMOR OF THIS STORY – NOT TO SUGGEST ALL SPRINTER VANS WILL GET THIS KIND OF FUEL ECONOMY! 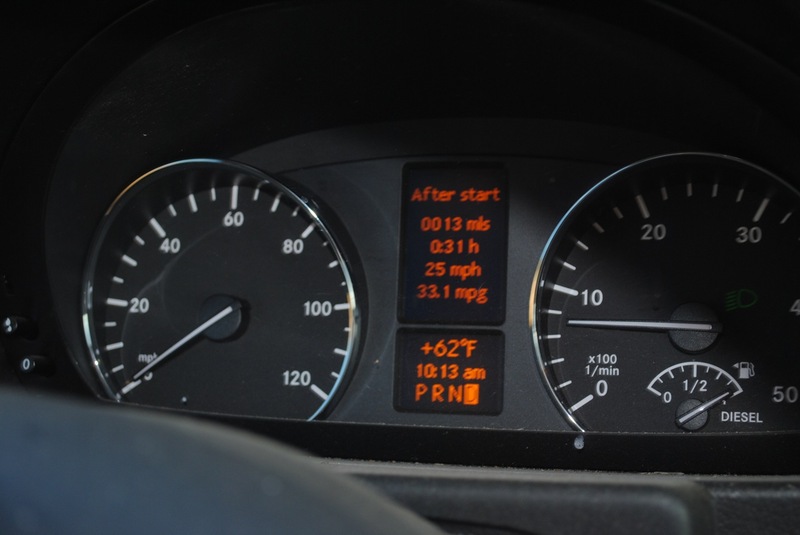 One of our Sportsmobile-Sprinter owners, let’s just call him JB, sent me this pic of his dash display. 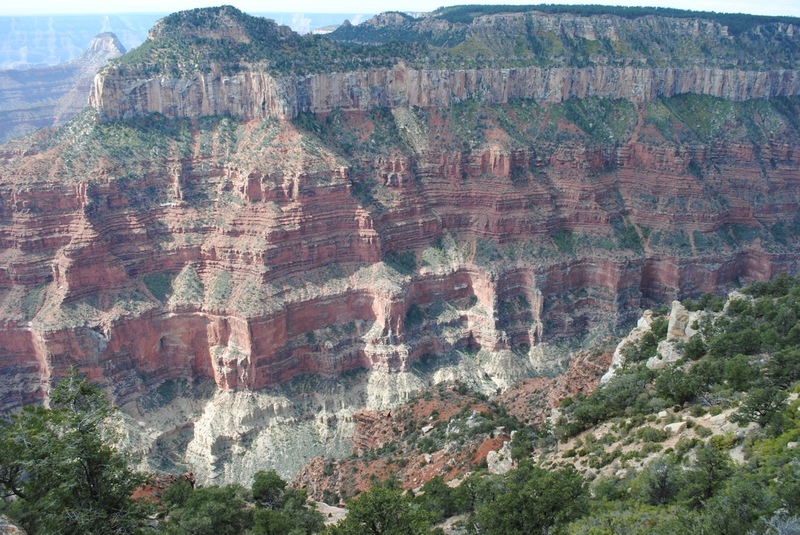 Seems JB was traveling around the Grand Canyon and started out the day at about 9,000 ft elevation. As you can see it’s 62 degrees, so most likely the A/C was off. And you see he traveled 13 miles in 31 minutes with an average speed of 25 mph. 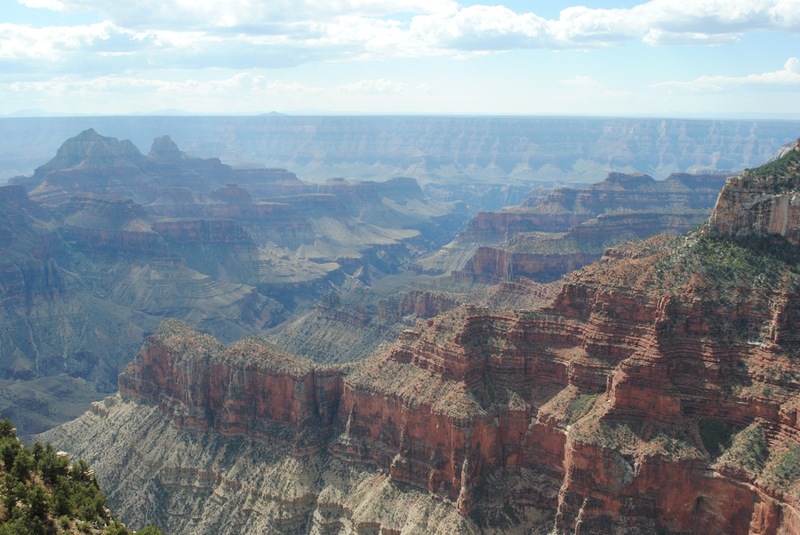 He ended at the 4,000 foot level, and took this picture…31.1 mpg. So here is proof the Sprinter Van gets “Best in Class” in the fuel economy area. Oh, and there’s more. Seems JB had made a wrong turn somewhere along the trip and had to head uphill to get turned around. No matter what, here are a few pictures of what JB saw while on this part of his journey. JB, thanks for sharing these photos with the Sprinter Guy and Sprinter Van lovers all over the world. 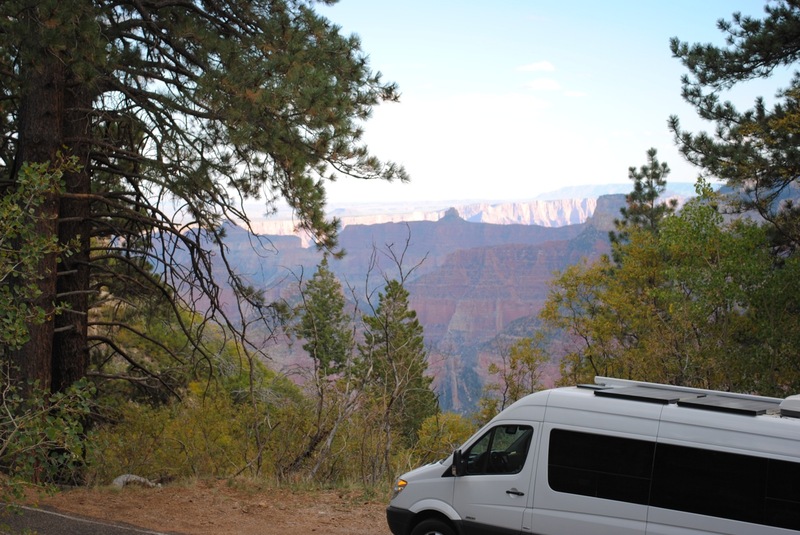 You can be enjoying the sites of our great nation in your own Sprinter Van with a Sportsmobile Conversion. Give Dave the Sprinter Guy a call at 512-942-6923 or email dave@sprinterguy.com for information about all things Sprinter. In an update to the story about JB’s fuel economy, JB was in for service last week, and we visited about his Sprinter and the joy it has given him over the past couple of years. He says that he consistantly will get 22-24 mpg driving normally all over the USA. But in reality, getting 30 mpg is not too out of what many owners are getting with their 2014 4 cyl twin turbo diesel with 7 speed automatic Sprinter vans. If you would like more info about a 2016 Sprinter van or the all new Metris Mid-Size van, just complete the form below and submit. I will return to you the info you request. Rare and Unusual Sprinter Vans – These are available today – BUT you better hurry if you want one! JB will never see such mileage regularly when out on the fwy or over the long term . The conditions on JB trip’s are not reflective of real world daily driving in which the average speed would be over 65 mph and rpm over 2500. After carefully documented an entire years worth of fuel usage I have discovered on average the actual mpg for a Sprinter van is well under 20 mpg. I am so sorry you took this literally, but as most folks who read it and responded directly to me saw the humor in this posting. No one has claimed a Sprinter van should expect to get this kind of fuel economy. But as you can see in the photos, this owner did, for a little while, until he had to turn around and go back up the hill to get to his turn that he missed. Fuel mileage that my customers claim to me, range from a low of 17 mpg on a 3500 Extended body, to plenty of folks who say they are getting 20 to 23 with normal driving. The biggest difference in fuel economy seems to be how heavy your right foot is. But I appreciate your comments, and feel free to comment on any future postings. Dave and Tom – Actually there is at least one other Sprinter owner who’s claimed a fuel mileage of 33 mpg (see my Sprinter RV blog post http://www.sprinter-rv.com/2011/01/28/thirty-miles-per-gallon-in-a-sprinter/), but that was in a T1N Sprinter with the 2.7-liter 5-cyl doing about 55mph with a tailwind. As mentioned in that post, there is hard mileage data for at least 18 Sprinters in the Yahoo Sprintervan roup, and fuel mileage data for 74 Sprinters on Fuelly.